Explore the far-flung Malay Archipelago and wonders of the world on this exotic 14 day expedition voyage from Darwin to Malaysia onboard Silversea's Silver Discoverer. Setting sail on 29 May 2015 from Darwin, Silver Discoverer crosses to Indonesia, sailing through the islands of Savu, Pulau Suanggi, Lomblem, Alor and Palopo. Guests, who are welcomed by traditional village ceremonies and performances, can also observe locals weaving and dyeing Ikat textiles, experience local cuisines, such as the lontar palm, and uncover ancient villages. This part of the world is also renowned for its crystal clear waters and pure beaches. Guests have the opportunity to go scuba diving and snorkelling to experience the incredible marine life that inhabit the stunning, vibrant reefs. On this voyage, Silver Discoverer also sails through Malaysia, stopping for an overnight stay in Sandakan. A paradise for animal lovers, Sandakan is located on the edge of the Kabili-Sepilok Forest Reserve, one of the few remaining virgin jungles in Sabah, where guests will visit Sepilok Orangutan Rehabilitation Centre, founded in 1964 to rescue orphaned and injured orang-utans. Continuing her journey through Malaysia, Silver Discoverer also stops in Pulau Tiga, a beautiful beach haven surrounded by dense rainforests, before voyaging to Kota Kinabalu, where guests disembark on 12 June 2015. This voyage is one of Silversea's select scuba diving itineraries, where guests that meet the scuba diving requirements* are able to explore a world beneath the surface. Aboard Silver Discoverer, a team of experts including Marine Biologists, Dive Masters, Environmentalists, Ecologists and Naturalists are on hand to share their extensive knowledge of the region. On this journey through incredible villages, Silversea Expeditions encourages guests to give back to the communities visited in the spirit of goodwill. The Expedition Team will be on hand to collect gifts such as second-hand children's clothing, school supplies and medical supplies, for example Band-Aids or first aid items, to evenly distribute throughout the villages. 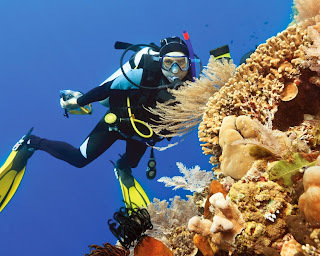 · Guests must bring their own SCUBA BCDs, regulators and dive equipment. The ship will provide weight belts and tanks.